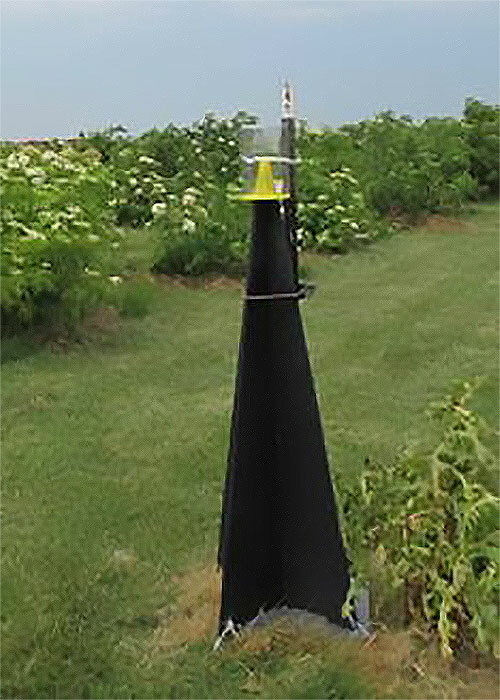 In specialty crops such as apples, researchers in West Virginia and Maryland have just developed a provisional threshold of 10 BMSB accumulated in one pheromone-baited trap located within the orchard or at the orchard border. Once this threshold is reached two alternate-row-middle sprays with 7 days between reduced the number of BMSB-targeted sprays while maintaining good control. Commercially available traps and pheromone lures for BMSB monitoring provide valuable information on presence/absence of BMSB and also help to decide if insecticide treatments are needed to manage this pest. Ag-Bio, Inc. (http://www.agbio-inc.com), Great Lakes IPM (http://www.greatlakesipm.com), Trece, Inc. (http://www.trece.com) and Sterling International are some of the companies that sell monitoring systems for BMSB. ALWAYS follow label instructions and safety procedures, and check to make sure the chemical you are using is registered for use in your crop. The goal of cultural control is to make the crop environment less suitable for insect pests or to manipulate the environment in such a way that insects are less likely to arrive on the cash crop. Most of the time, cultural control is used as a preventative measure. Research is being conducted in this area and no promising tactics have been identified, except for trap cropping. Trap cropping is a behaviorally-based IPM method involving planting very attractive plants next to a higher value crop so as to congregate the pest in trap crops where they can be easily attacked by natural enemies and/or killed by insecticides. Recent research with BMSB has shown that a trap crop mixture composed of sorghum and sunflower may be an effective management tool for BMSB. For organic systems, given the lack of effectiveness of most organic (OMRI-listed) insecticides, then flaming and vacuuming can be used to kill the arriving pests. 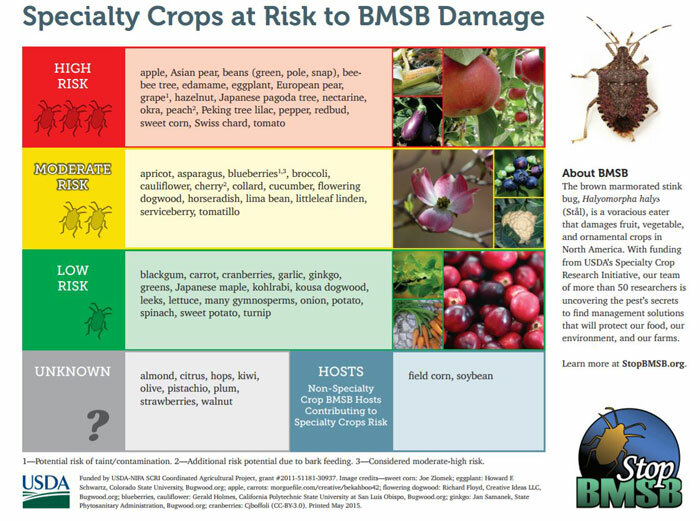 To access a webinar on organic management options for BMSB including trap cropping click here: http://articles.extension.org/pages/67200/brown-marmorated-stink-bugs:-invasion-biology-monitoring-and-management-webinar. Nielsen, A.L., Dively, G., Pote, J.M., Zinati, G., and Mathews, C. 2016. Identifying a Potential Trap Crop for a Novel Insect Pest, Halyomorpha halys (Hemiptera: Pentatomidae), in Organic Farms. Environmental Entomology. 45: 472-478. Abstract available at: https://www.ncbi.nlm.nih.gov/pubmed/26916518. Piñero, J.C. and Houseman, R. 2016. 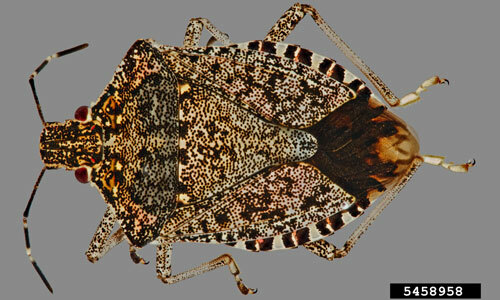 Brown Marmorated Stink Bugs in Homes. University of Missouri IPM program. Newsletter article available at: https://ipm.missouri.edu/MEG/2016/10/Brown_Marmorated_Stink_Bugs_in_homes. Quarles, W. 2014. IPM for the Brown Marmorated Stink Bug. The IPM Practitioner. 34(3-4). Available at: http://www.birc.org/IPMPJune2014.pdf. Stop brown marmorated stink bug. Available at: http://www.stopbmsb.org. Weber, D.C, Leskey, T.C., Walsh, G.C., and Khrimian, A. 2014. Synergy of Aggregation Pheromone With Methyl (E,E,Z)-2,4,6-Decatrienoate in Attraction of Halyomorpha halys (Hemiptera: Pentatomidae). Journal of Economic Entomology. 107: 1061-1068. Abstract available at: https://www.ncbi.nlm.nih.gov/pubmed/25026665.